In that post, I promised to email the Cabinet Member responsible for the Environment, Mike Priestley, and ask him what action could be taken to deal with this problem. I'm pleased to say that I have now received a response from Mr. Priestley, in which he says..
"I think you raise a fair point regarding Mostyn Street and I totally agree with you that it is a mess. 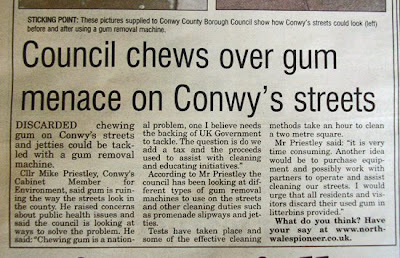 I would however, at this point like to state that chewing gum on pavements is a national problem. I have been looking at this problem and ways to tackle it for some time now and have seen a number of chewing gum removal equipment demonstrations. I have to say, only one has caught my eye. This year I will be looking to purchase some equipment to address the chewing gum problem and will be seeking the best and most efficient system. The biggest problem I see is the length of time it will take to clear a particular road or street of chewing gum. My department is looking into this with a view to working with partners. I can also look to place a business case to have a one-off cleanse followed by our staff keeping on top of the problem. The above, I believe, can make a difference to our streets and pavements and this is an issue I want to tackle." I'm pleased with Mr. Priestley's response and look forward to hearing what action is to be taken to deal with this sticky problem.